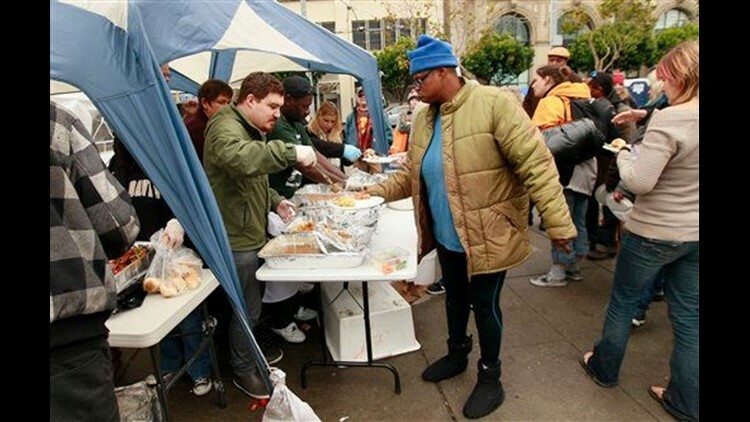 Anti-Wall Street demonstrators in encampments around the country spent Thanksgiving serving turkey, donating time in solidarity with the protest movement and, in some cases, confronting police. When officers ordered the driver to leave because he had no permit, police and about 150 protesters squared off, according to police spokeswoman Johnna Watson. One person was arrested, Watson said. "Why don't you arrest the drummers in the Thanksgiving parade?" a protester hollered. Associated Press writers Kathy Matheson in Philadelphia; Chris Hawley in New York; Ben Dobbin in Rochester, N.Y; Alicia Chang in Los Angeles; and Cristina Silva in Las Vegas contributed to this report.